Q: Who can list the property with us? A: All Laguna Phuket non-hotel residence units and do currently not join any rental pool of hotel management within Laguna Phuket. Q: How do I list the property with Laguna Phuket Rental Services? Q: How many options of Rental Agency Agreement? A: We currently offers the below optional services; both Exclusive and Non-Exclusive services to property owners in which the owners can choose which agreement they wish to enter. Exclusive Agency Agreement : Laguna Phuket Rental Program was initially launched on an exclusive basis as this will allow for a more efficient management of the property plus allow greater potential for maximum profitability to owners of non-hotel residences. Throughout the entire period of exclusive Agency Services, the property owner will be provided one flat exclusive commission rate for short and long term tenancy, which is 10% (before 7% Vat). Non-Exclusive Agency Agreement : This services has been extended to owners who would like to include Laguna Rental Services in their existing list of rental agencies. Our Agency Agreement offers flexibility for owners who wish to sign up on a non-exclusive basis. Q: Are the homeowners limited to use the property? A: No, the homeowners are not limited to use the property. However, the homeowners are required to inform the Rental Services at least 30 days prior to the property utilization as to ensure the is no any potential clients for the property. 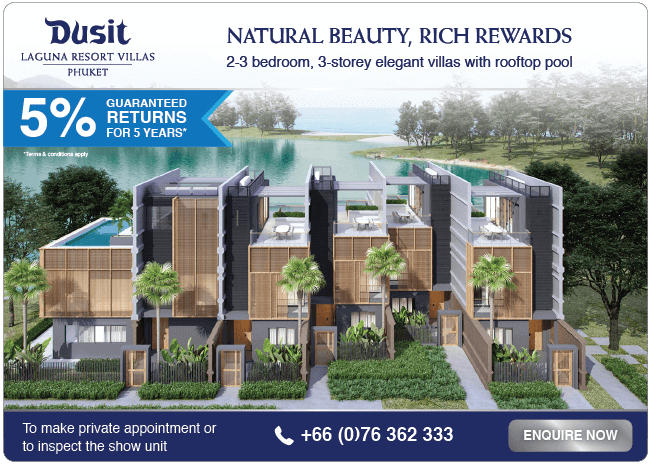 Q: Does the Laguna Phuket Rental Services provide the guarantee return? A: No, Laguna Rental Services provides a non-guaranteed return. Q: What is the standard furnishings for the short term and long term tenancy? A: The fully furnishings are requested for a short term tenancy, whilst only the basic amenities are required for a long term tenancy. After the property listing process is completed, the Rental Services team requested to inspect the property and return you with the improvements proposal. Q: How do we manage the property services to the tenant? A: We have a dedicated in-house team to provide the property services tailored to meet the tenant’s request in case the homeowners have yet to hire the services from any services provider. Q: What procedures to secure the property under Laguna Phuket Rental Services? A: A security deposit is requested from the client prior to the stay which is purposed to compensate to the homeowners for any losses and/or damages caused during the tenancy. In addition, we carry out a reasonable frequency of inspection during the tenancy to ensure there is any surprised major damages and losses to the homeowners at last minute prior to check-out. Q: How fast is the rental income transferred to the homeowners? A: We provide a clear statement of rental income to the homeowner after the booking is completed or month by monthly basis for the short term and long term rental respectively. We then transfer money to the homeowners within 15 days, after the statement is approved by the homeowners. Q: Are the tenants limited to use the facilities within Laguna Community? A: No, they are not limited. However, they are required to follow the policy and procedures of all individual hotel / business unit within Laguna Community. Q: Who can the tenant contact for any emergencies outside the operation hours (8.30-17.30 hrs.)? A: The tenant is provided an emergency contact upon check-in, so they can contact us as the first instance for any emergencies during the stay.